Aray：Madam Egoli， I know that your hometown is Rome. I have been very fond of Italian art since my childhood. When I started studying painting at the age of 12，I remember that the first sketch of the painting was a figure sculpture of Italy，the Michelangelo sculpture plaster replicat the Moses，which is still fresh in my memory. Later，I had the opportunity to visit my painting teacher's house. At the time when the Cultural Revolution in China was just ended，I saw the printed version of the famous Italian painter Raphael there. the depiction of the Graces by Rafael left a deep impression on me. I think this is also because of a young man’s worship of beauty. Madam Egoli：I am from Rome. Mr. Daniele Panfilo，who is with me today，is also from Rome. He was a professional tour guide before he came to work in the General Consulate，and he also knows a great deal of the history of Rome，the culture and the stories behind the famous sights of Rome. The art of Rome is world renowned，and the Roman ruins are well preserved. Aray： I also studied on the ancient Roman routes. In the process of promoting the activation and restoration of the South China Historical Trail，I borrowed some concepts from the ancient Roman routes. For example, as far as I know，the word “milestone”originated from the ancient Roman routes. The activation，utilization and restoration of the South China Historical Trail can stimulate rural tourism in various cities in Guangdong Province，promote the economic development of poverty-stricken areas in northern Guangdong and create more historical walking routes for hikers. Madam Egoli：I think it is very necessary to do so，especially in South China. Italians rarely travel to the southern part of China. The restoration of ancient ruins，ancient buildings and other monuments is conducive to attracting more tourists. In recent years，Italians have become increasingly interested in China. I think you have a lot of ways to attract tourists，including the restoration of historical sites. In this way people can learn more about China. Madam Egoli： When it comes to the ruins of Italy，in fact，there are many places in the Mediterranean region that well preserve the ruins of the Roman Empire. For example, in Tunisia in Africa，many remains of the ancient Roman Empire, including villages，are well preserved. The remains of the ancient Roman Empire were basically preserved and there was no damage to the remains, except for Colosseum. In fact，the ground and walls of the original Colosseum are covered with white marble，the Colosseum is pure white，very beautiful. Later, a member of the Bernini family ordered the removal of all the marble. This is an example of a ruin that has not been well preserved，but I think this is a special case. I think most of the ruins are preserved intact. The Roman Aqueducts is a very good example. The ancient Roman baths were also well preserved. The walls of the ancient Roman baths are equipped with pipes to transfer hot air and smoke，so the interior of the Bath is very warm. The ancient Roman baths now serve as opera houses. If you go to Rome in Summer，you can enjoy the opera in the ancient Roman baths，which is amazing. Because the ancient ruins are preserved，even if you are an Italian，you will find new discoveries every day in Rome. Aray： In addition，why do I pay much attention to the ancient Roman Routes. Because the history of the cities in Europe is inseparable from the origin of the ancient Roman routes. The layout of the cities in entire Mediterranean area，including the urban layout of Germany，was derived from the ancient Roman route. For example，the city of Regensburg was developed from the military observation post established by the Roman Empire. In German，Regensburg means the barracks on the banks of the Regen River. In addition, in my study of urban coats of arms，I found that many cities’ heraldic designs incorporate elements of ancient Roman art, such as pine cones，the scepter of the Roman legion that symbolizes power. The design of the crown also contains many elements of ancient Roman art，such as laurel wreaths and olive branches. Sorry for showing off in front of you. Madam Egoli： You are very knowledgeable. Actually，I think the most fascinating part of Roman Empire is not only the duration but also the extension. If you look at the maps of Roman Empire，it takes all over Europe and up to Asia. They are so smart in keeping the empire in good condition. They introduce good organization，good governance.They are not the kind of people to rule other cultures. They will be ok if you keep your own culture by yourself. But they are very good at the laws and social rules and social pattern to any kind of territory of letting people keep to their own culture. That explains why the Roman empire can stay for so long. Madam Egoli： Now I will go back to Rome，which is a good news.I don’t know yet. I go back to the Ministry and I work for the Ministry for 2-3 years and I will see other opportunities. Aray：I will bless you wherever you go. The road you have traveled will be the road with blooming flowers. You and your colleagues are welcome to visit the South China Historical Trail，and take a walk along this historic road of China and feel the infinite scenery. Madam Agoli：I would love to. I think it is essential to revitalize and well preserve the ancient trail. it is very interesting to our western eyes. we don’t know very much about Chinese culture in Italy. We really need to discover more. it is very interesting to see how another civilization has performed in such a brilliant way. 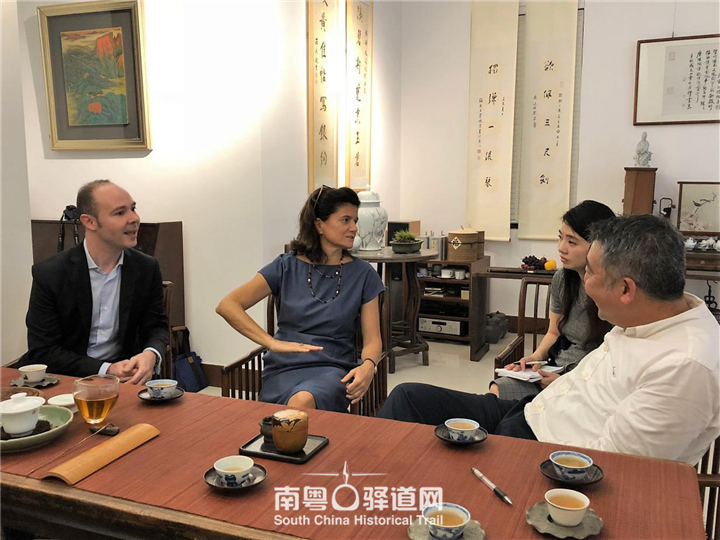 Aray：You mentioned just now that Mr. Daniele Panfilo knows a lot about the history and culture of Italy.We sincerely invite Mr. Daniele Panfilo，who is with you today，to give a lecture on Italian culture to audiences of South China Historical Trail Lecture Series. I will attend his lecture and will issue a certificate of volunteer for him. He will become the first foreign member of South China Historical Trail Volunteer team. Madam Egoli：We fully support it. I think he himself would like to participate in the volunteer program as well. 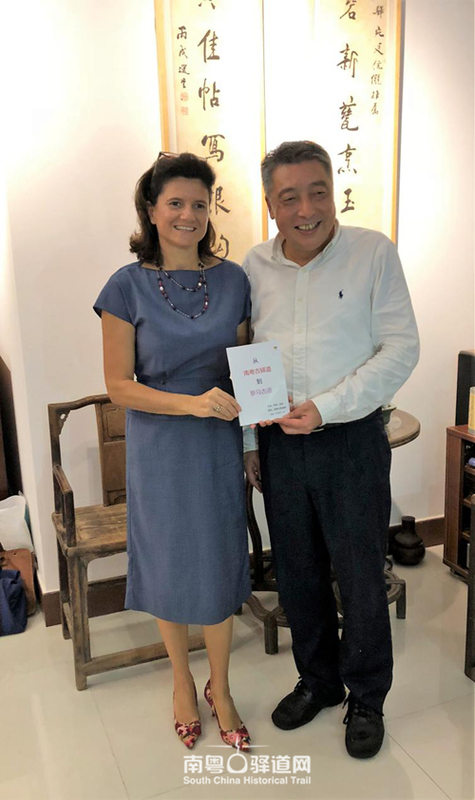 General Consulate of Italy in Guangzhou would like to provide our staffs to delivered lectures on Italian culture and civilization to the children and young people in China. 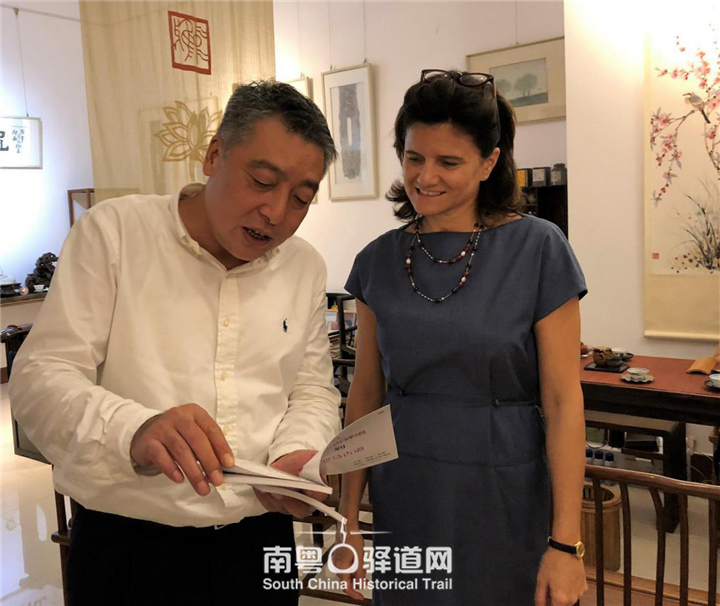 Aray：If you don't mind, today's conversation will be posted on the website of South China Historical Trail with the title of Dialogue between Aray and Madam Egoli，Consul General of Italy in Guangzhou on South China Historical Trail.